A delightful recounting, in word and image, of the work of a pioneering scientist and world traveler. “Do you really remember all the plants you’ve ever seen?” “Of course!” So replied Alexander von Humboldt (1769-1859), the famed explorer and naturalist, to a colleague’s query, adding, “I can remember even the smallest detail for years—from the shape of a leaf to the color of soil, the layering of a rock or a temperature reading. Why wouldn’t I?” Humboldt wasn’t bragging unnecessarily. Neither does his biographer, Wulf (The Invention of Nature: Alexander von Humboldt’s New World, 2015, etc. ), when she points out that he was the first naturalist to ask some of the critical questions that would later guide scientific investigations into plate tectonics, evolution, geomorphology, vulcanology, meteorology, and countless other fields—to say nothing of the fact that just about every continent bears names that honor his presence, intellectual or physical. In this “work of graphic nonfiction (for want of a better term),” Wulf teams with illustrator Melcher, whose work is whimsical, even a touch primitive—deliberately, one presumes, to fit the exploratory mood of the text. There are hidden depths in the artwork, however, for Melcher does wonders with collages and renderings that would do Joseph Cornell proud, making use of contemporary illustrations, modern photographs, and excerpts from Humboldt’s own handwritten manuscripts. (In one charming aside on a certain pelagic bird, Wulf notes, “I just wanted to note that Lillian Melcher didn’t draw the penguin…it looks very similar to her style, but I assure you that I sketched it in Callao.”) Readers new to Humboldt will surely find themselves fascinated by a man who went everywhere, saw everything, and spoke with the luminaries of his time, from Jefferson to Napoleon. And those who have already read and admired The Invention of Nature will enjoy this delightful graphic presentation. 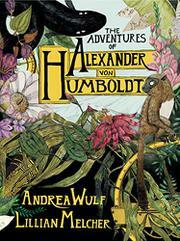 Alexander von Humboldt himself would doubtless have approved. A pleasure for students of science, art, and their intersections.